I always have the hardest time coming up with easy appetizers (that isn’t a cheese board). I don’t know why this is such a challenge for me? I think it’s because I want it to feel homemade, but I don’t want to spend a lot time making it. My focus is always on the main course, so the apps should always be easy. Can we talk about how easy and delicious this ooey gooey cheesy baked brie appetizer is? It’s also so pretty and perfect on it’s own, and such a crowd pleaser! Your guests will think you spent way more time on it than you really did. Isn’t that the point? ???? 1) Thaw out your frozen puff pastry and roll it onto a parchment lined baking sheet. 2) Generously spread the fig jam on the puff pastry then place your wheel of brie in the center. Spread more jam on the cheese and sprinkle the whole thing with flakey sea salt. 3) Wrap that puppy up, brush with egg wash and bake to golden perfection. I mean, can you even handle it?! It’s like a perfect little package just waiting for you to dig in. That buttery flakey crust literally has me drooling ????. Serve it alongside some delicious crackers and call it a day. Your holiday appetizer game just become so strong. ???? 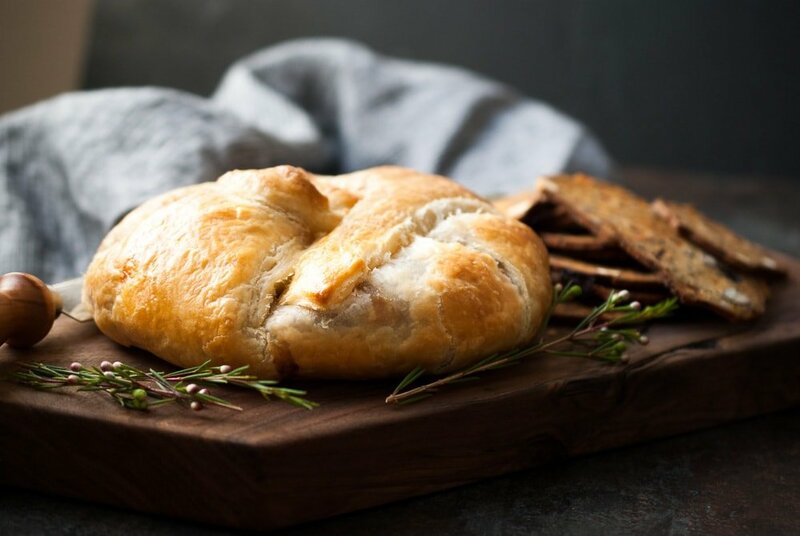 This Baked Puff Pastry Wrapped Brie w/ Fig Jam is the easiest and most delicious appetizer that will have your guests coming back for more! Preheat the oven to 375 degrees. Unroll the puff pastry onto a parchment lined baking sheet. Spread an even layer of fig butter all over the pastry, then place the wheel of cheese in the center. Spread more fig butter on top of the cheese then sprinkle everything with sea salt. Gently fold the puff pastry edges up around the cheese, making sure it's sealed all around. Whisk together the egg and water then brush the pastry with the egg wash, and sprinkle more sea salt on top. Bake for 25-30 minutes until the outside is golden brown and puffed. Serve with crackers or add to a cheese board! I made brie en croute last week, but it doesn’t look as nice as yours!! Where and what brand fig jam do you use? Hi!! Thanks for following along! I bought both the cheese and fig jam from trader joes! Can this be frozen until it’s time to bake it?